I parked on the steep little driveway along Route 4 where the Tunxis Mainline (Yellow Dot – see, that’s one of the 2015 fixes! I’ll not note them for the rest of this page, but rather just make the change.) reaches its northern terminus. I hiked in half a mile at dawn, through much poison ivy and along the perimeter of the Burlington state trout hatchery property. The area around the Yellow Dot/Punch Brook intersection is rather odd – and the reason is two-fold. Many of the hemlocks (this area is called “Hemlock Hill”) were harvested in 2000 due to the wooly adelgid blight and then, in 2002, “a tornado or downdraft wind killed or damaged most of the trees left in this 8 to 10 acre plot.” (According to a sign along the trail.) It appears the same storm knocked down the trail head sign (above) as well. 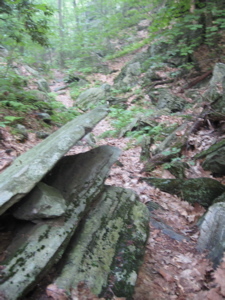 As a result, there is much brush and scrub underfoot to pick through while searching for the purple-dotted blue blazes of the Punch Brook Trail. 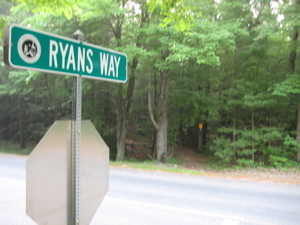 Alas, I found it and headed southeast through the Nassahegan State Forest. 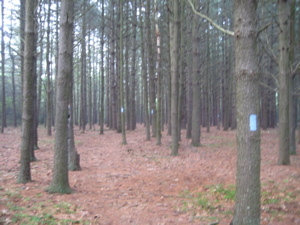 Immediately, I was thrust into a wide open pine tract that strangely was once a baseball diamond(?) – this is what the Walk Book tells me anyway. It was all very pleasant, if only for the two minutes it took to walk through it. Down towards the actual Punch Brook and it’s many little ponded areas, up a short yet steep little incline, then back down again to the Red Dot intersection. 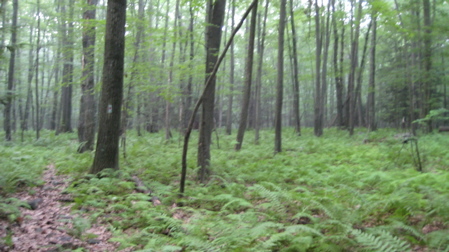 I continued (southwest now) on the Punch Brook, following along Punch Brook, through some cool fern covered swampy areas. 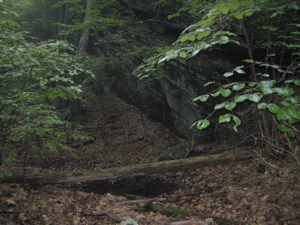 Before long, I crossed Punch Brook Road on the Punch Brook Trail right alongside Punch Brook. I punched myself in the head at this point, just because. Feeling punchy, I drank some Hawaiian Punch and reached the end of the Punch Brook Trail where it hit the Tunxis Yellow Dot, just off a residential street. 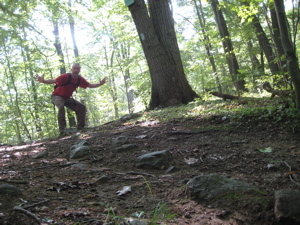 I punched my ticket and had one more Tunxis Burlington Regional trail completed. 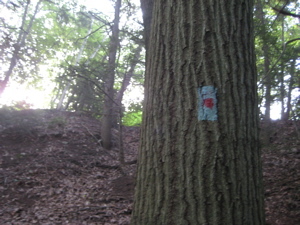 I backtracked the three-quarters of a mile to the Red Dot Trail and got going with that one. Bear with me here… as this trail has undergone a lot of changes since my 2008 hike… From the Punch Brook Trail intersection, I hiked through some fir trees and then up to a rather nice residential street – Ryan’s Way. 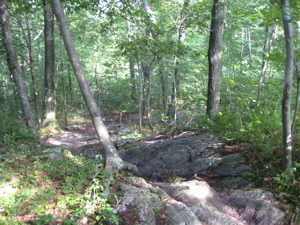 Once down that road a pace, the trail crosses, yes, Punch Brook Road again and then descends to little brook, now in the Taine Mountain Preserve. Ironically, Taine Mountain wasn’t preserved too well on its eastern flank, as that is now a McMansion subdivision – which is what split the Red Dot into North and South sections. 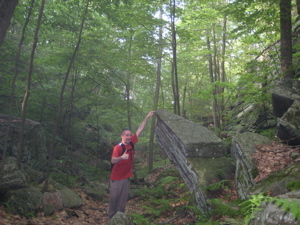 After Perry’s Lookout (really only interesting because no one seems to know which Perry it was named for – The Perry family with a house at the corner of Punch Brook Road or Perry Deming who helped clear and cut the trail I was on) the trail does a funny thing: It doesn’t follow the map. 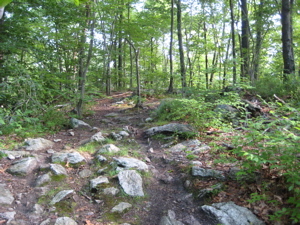 It veers left down to Taine Mountain Road, follows that a bit, and then circles back to the bottom of Taine Mountain reconnecting with the trail I described two paragraphs above. Hm. I wasn’t expecting that. 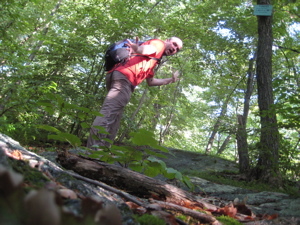 So I trudged back up Taine Mountain, past the New Britain Water pipeline right-of-way, and followed what was the old Red Dot trail up the ride to the true summit of Taine. Don’t do this. It’s not worth it and there are no views. 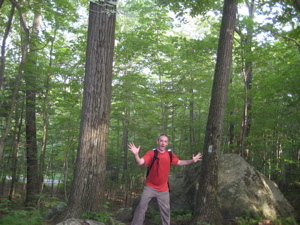 I did it just to do it… The summit area is a wide, flat expanse and it’s only slightly over 900 feet. 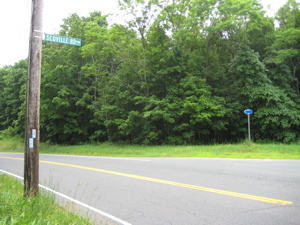 Once I could see I was near the construction of new houses on the eastern flank of Taine Mountain Road, I veered right (south) down the ride. The woods are open so it was no bother, but it’s highly unnecessary. I descended down, down, down heading straight towards the intermittent traffic sounds from the George Washington Turnpike. 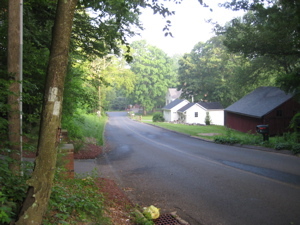 I popped out onto the road very near its intersection with Jerome Avenue, crossed, headed west a bit, peering into the woods for the Red Dot South Trail. It took some serious peering, but I finally spotted it and headed back into the woods to the confusion of some neighbors doing yardwork. Oh well. 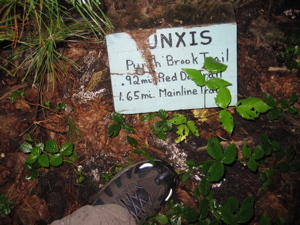 Once I found the trail right next to a private yard with a quizzical woman gardening, I dipped down to a Wildcat Brook and then ascended fairly steeply up Wildcat Mountain, elevation 850 feet. 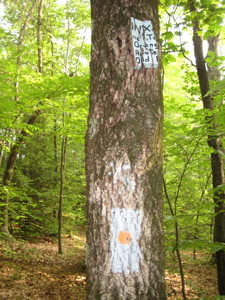 This area supports a rich population of American chestnut trees and has been the focus of a chestnut tree research project. One hundred years ago, magnificent American chestnut trees dominated the forested hills and mountains over much of the eastern U. S. They made their best growth on the slopes of the Appalachian mountains where some towered up to 100 feet and had diameters greater than 10 feet. In some places, chestnut trees formed nearly pure stands. 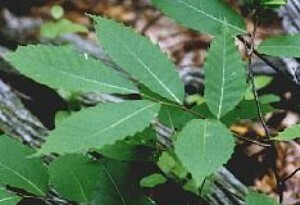 It has been estimated that one out of four trees in the Appalachian forests was an American chestnut (Castanea dentata) prior to the arrival of the lethal chestnut blight, a fungal disease which destroys the bark tissues of the chestnut. The chestnut blight was first noticed in New York at the Bronx Zoo in 1904, but according to chestnut researcher, Sandra Anagnostakis, the blight was probably first brought into the northeastern U. S. sometime in the late 1800s on Japanese chestnut trees. The blight spread like wildfire from the northeast southward killing almost every American chestnut tree throughout the eastern U. S.
Our chestnut trees had little or no resistance to this exotic fungus (Cryphonectria parasitica), because the American chestnut had evolved in North America isolated from the Asiatic chestnut trees which had evolved with this parasitic fungus and had developed some resistance to it. By 1950, billions of American chestnut trees in the eastern U. S. had been killed by this exotic fungus. Now, only rare sprouts remain, clinging to life in the forests–puny relicts of the giant trees they once were. 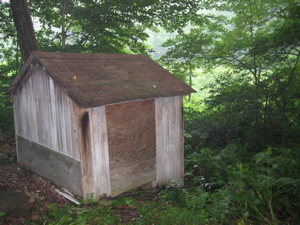 Very rarely, a sprout lives long enough to flower and produce nuts but they are usually infertile from lack of cross pollination; even this is cause for celebration among American chestnut enthusiasts, but the euphoria is short-lived because these fruiting trees usually die just a few years later. 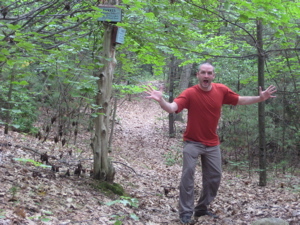 On that note, I finished the rather unexciting (as a non-chestnut enthusiast) Red Dot South Trail. Okay, let’s get to the good stuff. The Orange Dot passes through something I’d been looking forward to for quite some time: Devil’s Kitchen! What an oddly named “box canyon” – how exciting! 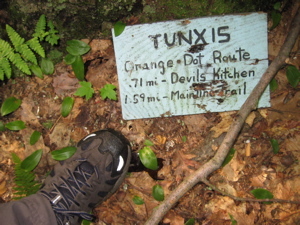 After leaving the Red Dot South Trail and crossing Stone Road (which is not paved here, by the way, but quite drivable) I hiked on the Tunxis Yellow Dot for a few minutes looking for the trailhead. And kept hiking… And kept looking. I somehow missed the turnoff south – was the ol’ Devil messing with me? 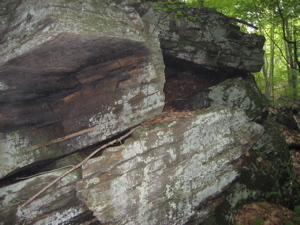 This is a pleasant hike and for the first time all day, I found myself ambling through, up, and over some large boulders. 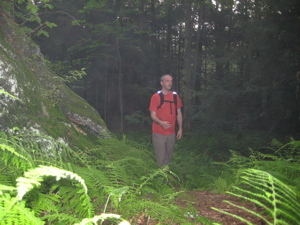 The persistent buzz of mosquitoes and deer flies kept me moving along pretty briskly, to say the least. I’d forgotten my bug spray at home – more work of the devil, no doubt. I reached a plateau of sorts and found myself staring down into pure hell (not really)… Devil’s Kitchen! Dunh-dunh-dunnnnnnnh! I had read that this was “a very long box ravine with a series of small cloven canyons.” “Cloven” canyons? Really Walk Book? Such imagery. As I picked my way through Devil’s Kitchen I was struck by just how… How this really wasn’t all that great. It pales next to Tory Den a bit west of here as well as the Mile of Ledges off to the west as well. But it’s still definitely cool. 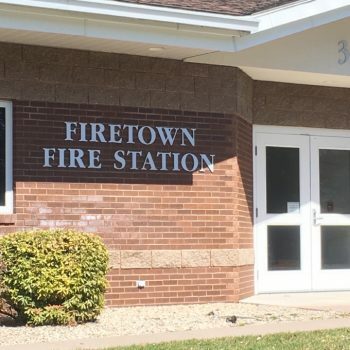 There is some controversy about how this place got its unique name and no one really knows anymore. You can read my in depth report about it here. I have developed my own theory… There are many little pools of standing water in the rocks here and I imagine in late spring there are even more. Prime mosquito breeding grounds. And boy, were they bred well. I was attacked by them constantly (and mosquitoes very rarely touch me). Deer flies appeared from nowhere and bit my arms and neck as if sent directly from Satan himself to do so. It was crazy! 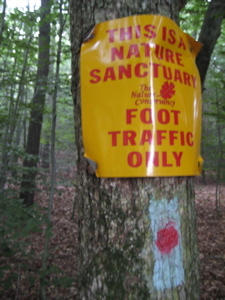 But it hardly ruined my hike. I trudged onward, having survived the perils of my devilish trek. 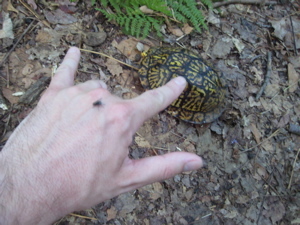 Satanic Deer fly warding me off from a box turtle minion! I soon hit a woods road (Stony Hill Road) and resisted the temptation to take a picture of a stony hill. 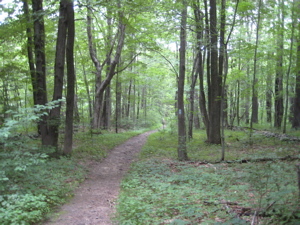 Shortly, I crossed the Tunxis Yellow Dot Trail at Clarks Corners and kept going west along the flat dirt road. I picked up the pace, getting in some jogging as this would be a backtrack section and if I’m going to see something twice, I can see it twice as fast. That’s logic for ya! I soon hit Lamson Corner and the cemetery right next to it. 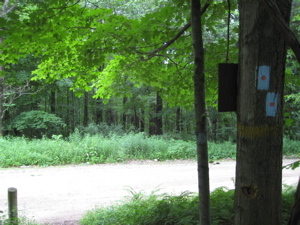 I crossed Route 69 and a bunch of cyclists preparing for a ride, entering the woods again next to the large parking lot. Burlington sure does recreational folks a service, that’s for sure. A slight ascent, a walk across the (dirt) East Chippens Hill Road, and another few minutes jog to the end and the third juncture of the Yellow Dot. I turned tail, this time noticing more of the household appliance dumping ground along the way and passed the same cyclists now 20-some minutes later. This time, they stared at me like I was totally lost and needing some help. I smiled and waved and walked back into the woods next to the cemetery. 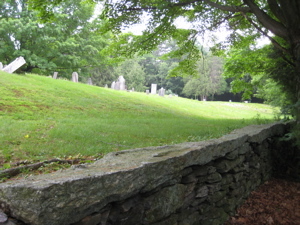 Burlington – Lampson (sic) Corner Cemetery – A very old Cemetery, with some occasional orbs and lights. Incorrect info passed on about the Smallpox, it is haunted though. 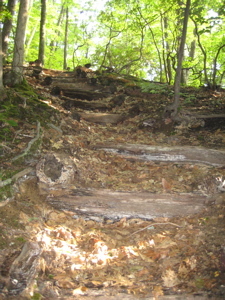 Hikers from nearby trails have seen apparitions and orbs of light. 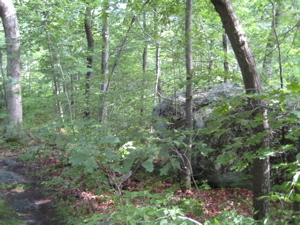 One hiker reported seeing a man in uniform standing near a gravestone, yelled to him for the time and the man disappeared. the hiker walked over and it was the grave of a WWII Veteran. 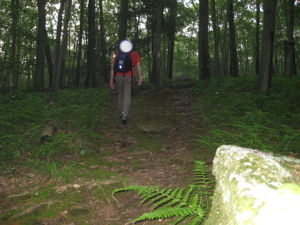 “Orbs of light?” Like the one on my head in the picture at the end of the Red Dot North Trail up above? Dopes. Another broken sign at the end… More Devil’s handiwork? Burlington does a spooky Halloween hike around here utilizing the cemetery and Devil’s Kitchen, which I think is pretty fun. As for me in June… it was time to head back north up towards my car. From there, I went on to complete the White Dot back over to the Fish Hatchery area and my car on Route 4. Although my day involved a few backtrack sections, an aggravating loop I wasn’t expecting, some road walking, an annoying bushwhack, very few views if any, and bugs out the wazoo, it was a great day out in the woods. Very varied and historic. 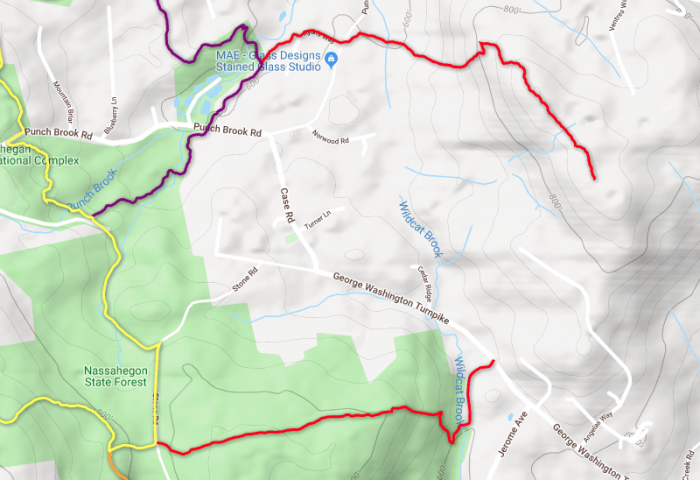 At this point, I still had some Yellow Dot and the Nature Center Connector trails to do, but was nearing the end of my Tunxis adventures in Burlington – until 2014 when they added more trail. But it’s not like I knew that in 2008.